Rev. Friedrich (Frederick) Hoffmann was born in Sangerhausen, Germany on May 22, 1856. At the age of 14 year, Friedrich traveled to Hamburg, Germany to live with an uncle who was a deacon in the Baptist church. It was in Hamburg that he became acquainted with the Baptist denomination that he would spend a lifetime serving. The Rev. Friedrich Hoffmann family. Photograph courtesy of Marcy Strawn. Friedrich was baptized by Rev. Rohde who served the Baptist church in Hamburg at that time. Inspired by the sermons of Rohde, Oncken, Lehmann and Koerner, he served as a missionary with Rev. Rohde in the suburbs of Hamburg (Altona) where he began preaching in 1876. 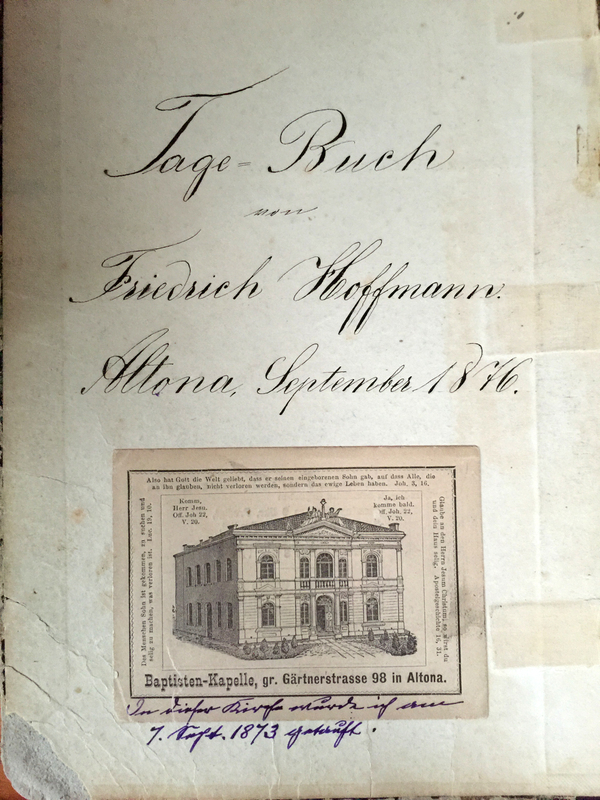 Inside cover of the "Tage-Buch" (journal) of Friedrich Hoffmann, dated September 1876 which features a drawing of the Baptist Chapel in Altona (Hamburg), Germany. Courtesy of Marcy Strawn. Feeling the call to serve the Lord more fully, he accepted an invitation from Professor Walter Rauschenbusch of Rochester, New York to come to the United States in 1878 and study at the Rochester Theological Seminary there. In 1882, he graduated from the seminary and accepted a call to serve a church in Minonk, Illinois. There he met his future wife, Gustava Schiebeck, who was a great help to him throughout his ministry. In 1885, Rev. Hoffmann was called to serve the First German Baptist Church at St. Louis, Missoui where he spent 12 years and led the building of a church and parsonage. Buffalo, New York called upon Rev. Hoffmann in 1893, and he became pastor of the First German Baptist Church (later the Spruce St. Baptist Church). From 1906 to 1911, Rev. Hoffmann served the First German Baptist Church (later the McDermot Avenue Baptist Church) in Winnipeg, Manitoba and led the effort to construct a large church. From Winnipeg, Rev. 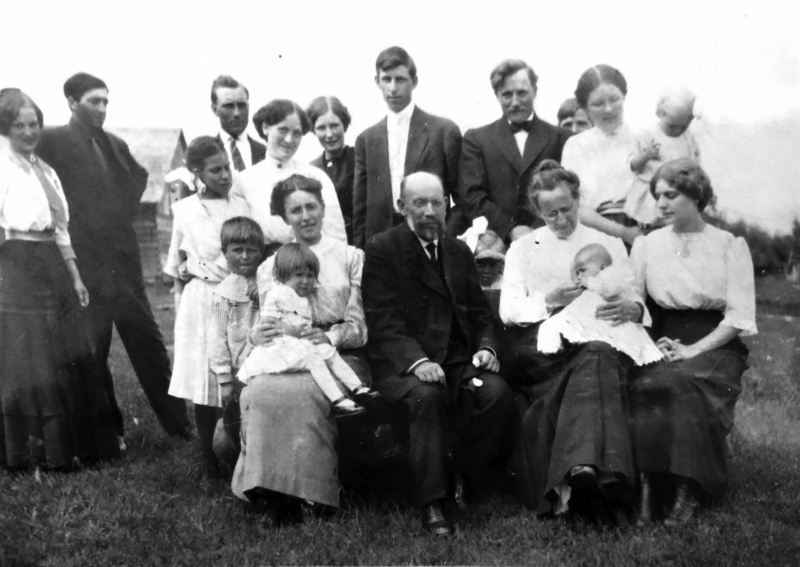 Hoffmann traveled further west to serve the church in Leduc, Alberta, Canada for a period of five years. In 1916, Rev. Hoffmann was called to Portland to serve the Second German Baptist Church which would later be known as the Immanuel Baptist Church. Rev. Hoffmann was instrumental in growing the membership of the congregation and expanding the church structure. Rev. Hoffmann not only served as pastor, but had fine musical talents. He composed many songs played several instruments. He also taught many people to play musical instruments. Rev. Hoffman was also instrumental in the construction of a home for the aged in Portland. Rev. Friedrich Hoffmann died on November 30, 1941 in Portland at the age of 85. On December 3, 1941, all the ministers of the Oregon Baptist churches came to carry his remains to his last rest at the River View Cemetery. On Sunday, December 14, the Immanuel Church held a memorial service attended by a large group of family and friends. At the time of his death, Rev. Hoffmann was survived by his widow, two daughters, seven sons, eleven grandchildren and one great-grandchild. 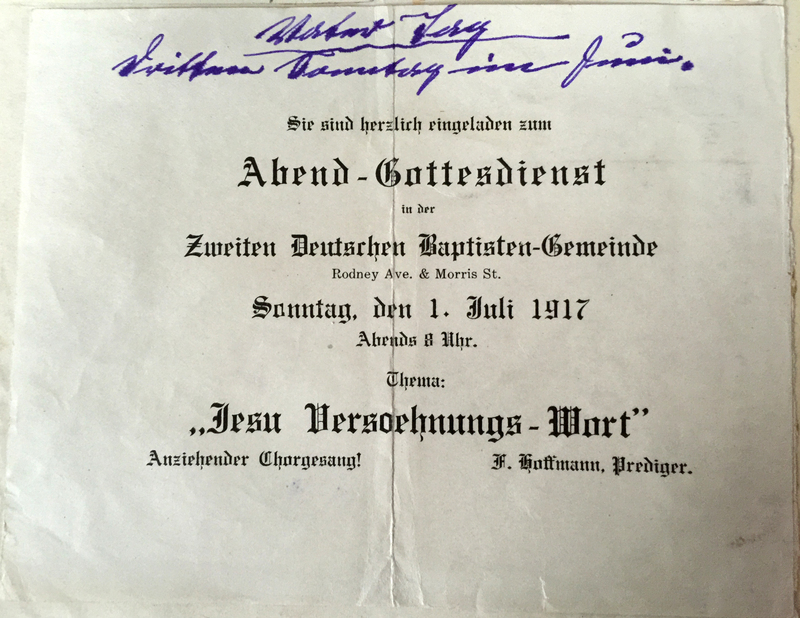 Announcement of the evening service on July 1, 1917 at the Second German Baptist Church led by Rev. Hoffmann. Courtesy of Marcy Strawn. Roth, Otto. "Obituary for Rev. Frederick Hoffmann of Portland, Oregon." The Baptist Herald, January 15, 1942. Marcy Strawn, the great-granddaughter of Rev. Hoffmann, donated the Tage-Buch (journal) of Rev. Friedrich Hoffmann to The Center for Volga German Studies at Concordia University where it is archived. Last updated January 30, 2016.